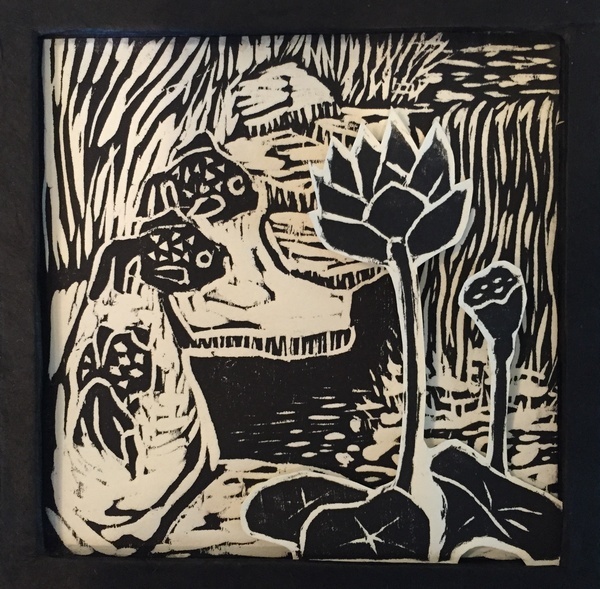 This is a small white line print that I started from a carving in Australia. 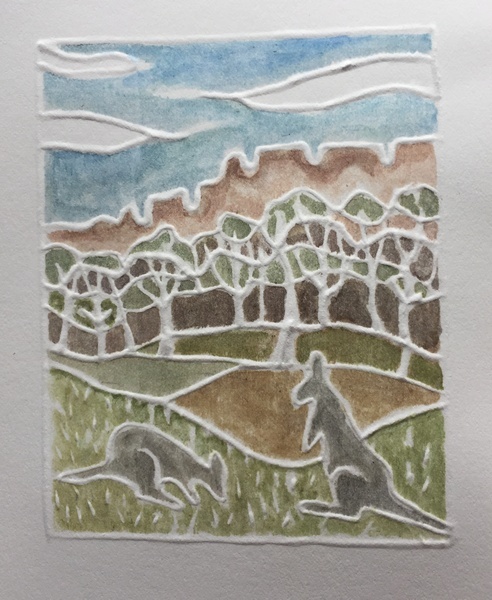 I was spending a few extra days with friends after the Grampians conference and inspired by the white line works of Andie, a student who took my class last year. She did a whole series of the Grampians during our time together last year and after. This year she gave a small accordion book of all those prints reduced to fit the format. 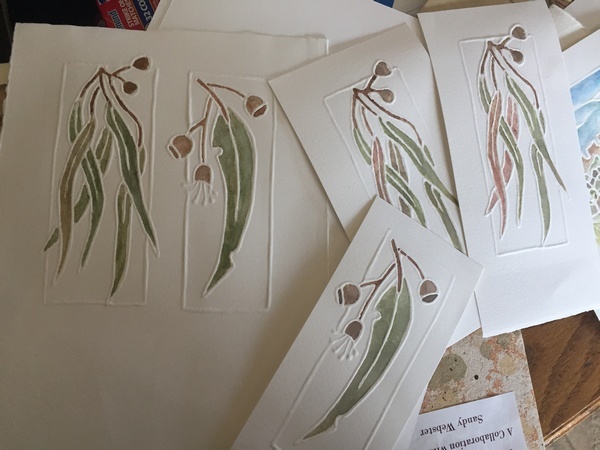 While teaching white line printmaking down in Hobart, Tasmania I carved a block with two types of Eucalyptus leaves and pods. The block is only about six inches square so I put the images side by side. And during my time at Baldessin Press shortly thereafter, I experimented with carborundum plates. Here is the start of both. Using carborundum is tough. It is like pouring sand on lines made with glue, shaking off whatever does not stick. 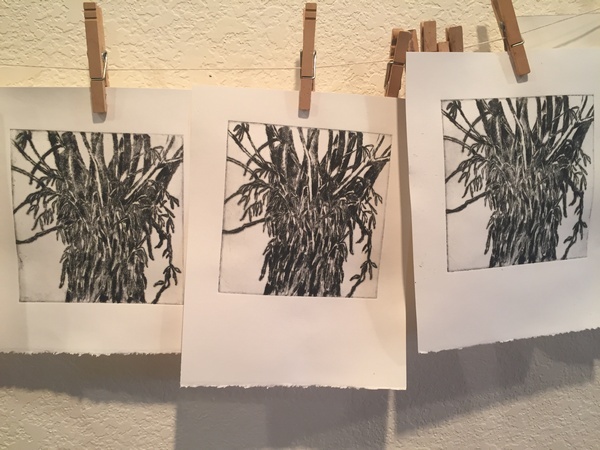 Then you wait until it is totally dry to ink, wipe off and put in an etching press. There is little control and even less opportunity for details on a smallish plate. This one is only about three by four inches. If the paper is too wet then the rough carborundum takes some of it off when you remove the plate. It is hard to wipe the plate as the roughness tears at whatever you are wiping it with. I am not giving up on this technique but I do need to do some serious research on how to use it to good effects. I did have time this week to work on the small carved block to try various papers that would work best for white line printing. The softer papers worked best….Rives BFK or Somerset Velvet. I also think it is best with these to print the images separately rather than together. My good old crispy feeling Stonehenge worked well for dry point etchings on vinyl plates. 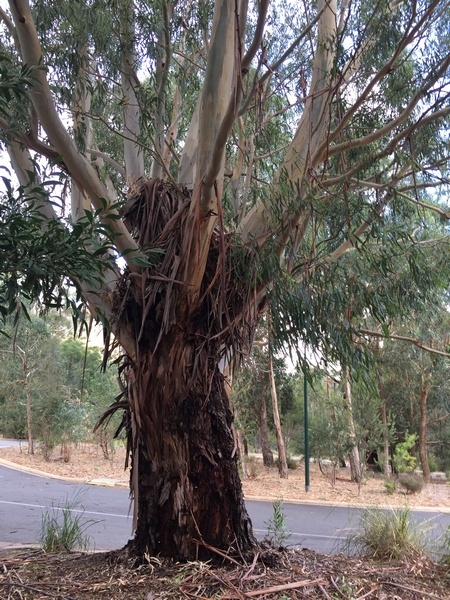 I wanted to capture the shedding of the Eucalyptus trees like in this picture. I started the drawing and etching while spending those extra days at Halls Gap in the Grampians. It took several passes with paper that was too wet and realizing that the drawing needed to be improved upon before I got five that were okay. 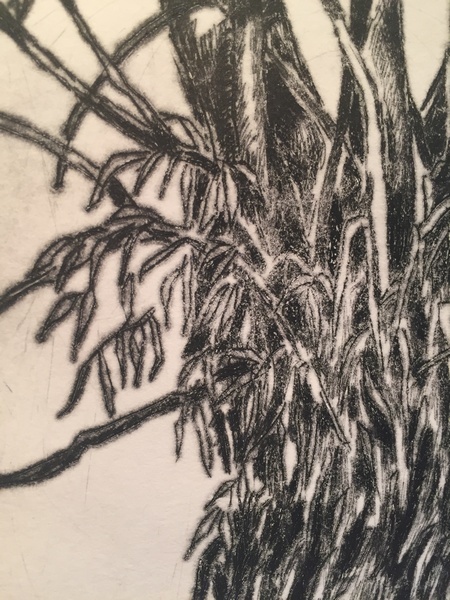 Here is a detail of one where you can see that the lines are a bit furrier than I would have liked. I also realized during the process of putting ink on the plate that the small plastic credit card was making hair line scratches. Wherever they appeared I had to draw a new branch or leaves to camouflage them. So now I use only the cutoffs of davey or book board. And while talking about printing. I took some white line prints into the craft shop at the John C Campbell School and donated another one to their auction. Actually this one….well sort of this one….minus the lotus in the foreground. 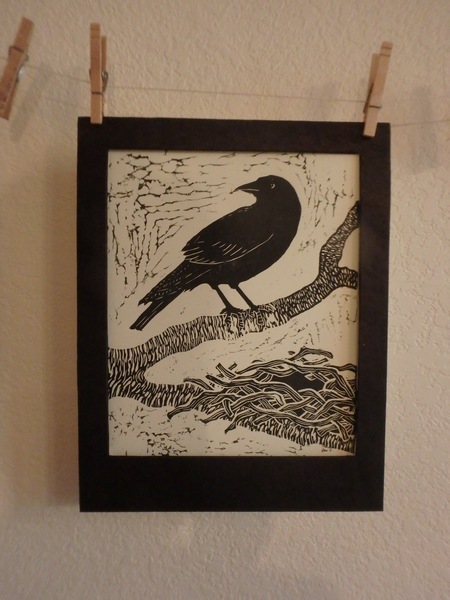 New frames arrived today to put two of the last of these crows into. Just need to order glass. Also new frames for larger white line prints. And speaking of the folk school, the evaluations of my class from students arrived today. There were eight students. One of them only mentioned that the chairs needed wheels, five said very positive things about the class and the instructor, and two were different from what I have seen before. One of the two thought I was just a bit impatient and the other claimed that she and I failed to bond on a personal level, “due to no one’s fault”. And both of them wanted handouts. There were handouts of syllabus and how to marble papers using earth pigments. Recipes for making corn flour paste and gelatin plates were written on the board for them to copy as well as internet sites relative to the class. 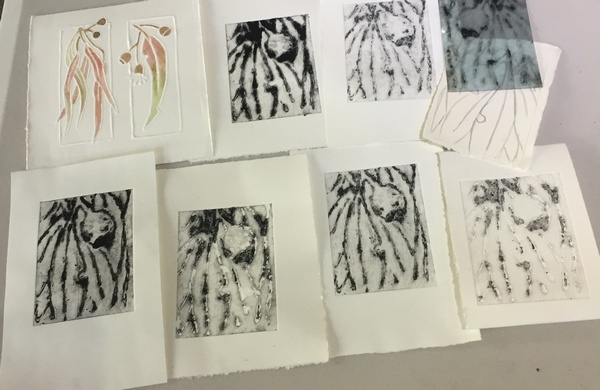 It was a hard class to teach contact printing with plants as there were so few out week before last. Most of them bought my book on Earth Pigments, so there was printed information there on what we were doing for part of the week. But the evaluations are wonderful to receive. You never really know what the students are truly thinking and this gives them a chance to tell you. The next time I am scheduled is not until November. A friend may arrive to help me keep any eye on the situation here at home, I won’t be just arriving back from Australia by less than a week, I won’t be looking for leaves in a class about stitching in and on books, and I might be a bit more patient and ready to bond on personal levels.